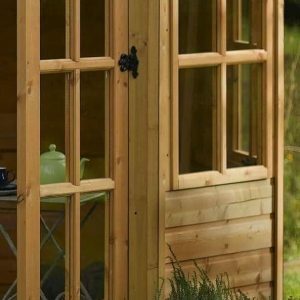 One great feature of this summer house, aside from the octagonal shape, is the fact that it has four good sized opening windows which are made with toughened glass. This is great for the balmier times of year, and also ensures you get plenty of light. The structure also has a very attractive design, largely because of that gorgeous looking cladding. An interestingly shaped plywood roof gives lightness to the whole building too. On the roof is a covering of mineral felt that is heavy duty, and capable of dealing with any weather conditions that are thrown at it. 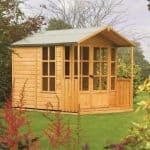 This is one very strong, long lasting and as you can see very attractive looking summerhouse. The wall cladding is 12 mm thick and as it is tongue and groove shiplap cladding it is going to be able to keep the rain out and look nice while doing it. The cladding and frame are not the only incredibly strong aspects of this. The floor is made with some fantastic looking, 12 mm thick tongue and groove boarding which is some of the thickest and strongest flooring we have ever seen. A lot of thought has clearly gone into making sure this is a structure that is just as strong as it is attractive. 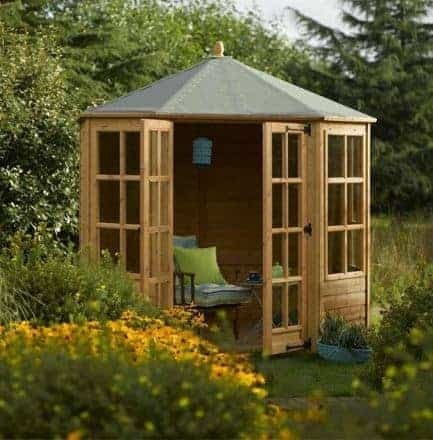 Now here is a style of summerhouse that you do not see every day, the Rowlinson Ryton Octagonal Summer House with its awesome, octagonal shape really does stand out from all the other summerhouses and would make for a fantastic addition to your garden. While this does have a very impressive look it is not actually so huge that only larger gardens can enjoy it. Of course due to the octagonal design it is has a very interesting floor shape, but you roughly are looking at around 8 feet of width and depth to make use of. 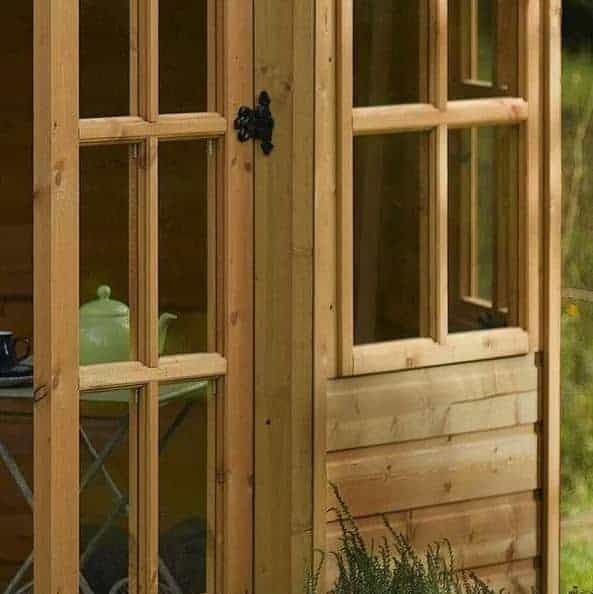 This is not the largest summerhouse we have seen so you may have to be a little more crafty with the way you organise things, but there is still more than enough space in here for a few chairs, table and most importantly a TV and a small fridge. The headroom inside of here is very generous even at its lowest point there is just over six feet of height with the high point being 7 feet 6 inches. We really love this roof. It resembles something that you would see on a castle and actually when you are sitting in here on a nice summer evening with a drink in your hand you really are going to feel like a king or queen. On a normal shaped summerhouse this would be a general apex roof, but do to the interesting shape of this summerhouse the roof is almost conical in its design and we really do love the way it looks. The roof is made with plywood which is then covered with high quality mineral roofing felt. Rain, snow or whatever else our awesome British weather decides to throw its way is not going to be any kind of problem for this roof. Rowlinson have really outdone themselves with the cladding on this summerhouse. They have used 12 mm thick tongue and groove shiplap cladding and done it in a very stylish way. It looks very smooth that we are sure one of the first things you are going to want to do is run your hands along it. This cladding in addition to being very easy on the eye is also incredibly strong and up to the task of keeping out even the most torrential rain. 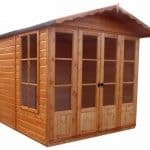 We are very impressed with the robustness of this summerhouse. It is not just the cladding that is strong, the frame inside of here is nice and chunky and is going to be one of the main reasons you are able to enjoy this for many, many years. The flooring is perhaps the main thing that took us by surprise with this summerhouse. We have seen tongue and groove flooring used before and we are always big fans of this, but the floor in here is a phenomenal 12 mm thick. We have seen 8 mm and 10 mm, many times before, but 12 mm is actually quite rare. This though just ensures the floor is very strong and able to take a lot of weight. Plus let’s not overlook the fact that tongue and groove boarding looks gorgeous and certainly helps with the overall charm of the summerhouse. As is the case with most other summerhouses, the Rowlinson Ryton Octagonal Summer House will be protected during transit and installation thanks to a basecoat treatment. You will need to get the brush and tub out though and give it a coating of wood treatment yourself, shortly after construction. A fresh coating once a year should be applied, you do this and rot and decay will never be an issue. 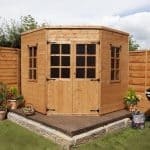 There is a ten year warranty this summerhouse, but in order to make it valid treatment must be applied on an annual basis. This we feel is fair and is the case with most multi year guarantees. Even though this is not one of the larger summerhouse on the market they still are using some large double doors. We really like the design of these doors with their large windows. They are made with some very thick frames that makes them feel very solid and they will never sag thanks to the use of some impressively strong and long lasting hinges. As great as these doors are at this price range we really would have liked to have seen some kind of locking mechanism included on the doors. As well as the windows that are on the door there is another four large windows on this summerhouse. These windows are all made with strong toughened glass and all four of them can be opened. So if on the odd chance we do get a hot summer, you can open up the windows and let in some fresh air. The general design of this summerhouse is very secure, but as we touched upon just above there is no lock included with this. We would suggest that you think about adding some kind of lock, even if it is something as simple as a pad bolt and padlock. Those lovely and large windows really make looking inside of here very easy. So privacy is not something that this is offering, but this is the case for pretty much every summerhouse we have ever looked at so we will not put it down for this. You could always add blinds or curtains if you were a concerned over people being able to look inside or even just to make it a little cosier in the winter months. If you wanted to give this summerhouse a little bit of your own style then one way to go about this is with some coloured wood treatment. 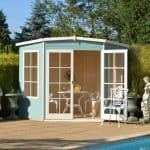 You need to treat the summerhouse anyway so have a think about using one that is coloured. No specific extras are offered with this, but we do think you should give some serious thought to adding at the very least a pad bolt for security. 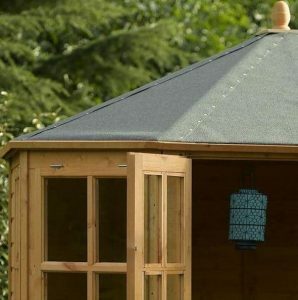 This is one very high quality summerhouse from the roof all the way to that impressive 12 mm thick floor. This is going to be something that sits in your garden for many years. You are going to be able to enjoy lots of glasses of wine in here and take in many sunsets as this really is going to last you a very long time. This is a summerhouse that looks a lot larger than it is. Do not get us wrong there is plenty of space in here, but you may have to put some thought into the way you lay things out. We do not see you having any trouble with this in terms of its installation. Just have a friend their helping you, and you will find this to be quite the enjoyable experience that should take you around 6 hours at the most. 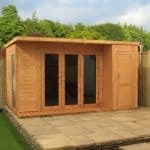 This is a high priced summerhouse, but we feel the extra money you are paying is for the overall high quality of it and because of this it does make it the price it is being sold for rather reasonable. 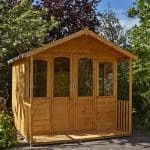 Final Thoughts: The Rowlinson Ryton Octagonal Summer House is one of the most high quality summerhouses we have seen and you are paying a rather premium price for that quality. 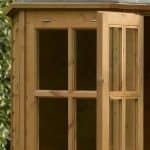 However before you dismiss this as being overpriced, we must tell you that the materials used here are top of the line and they make this one fantastic looking summerhouse which is going to last you 20 or more years. We really like what they have done here and if you are willing to save up a little longer or even just go for it and treat yourself then you are going to really like it too. During construction my fingernails frequently damaged the soft wood. Nails supplied were very weak. Door hinge broke first six months. Felt poor quality . However having spent money and time on replacing these items and constant wood preservation I have a good summerhouse .